Our Heroes wake up naked and cold with the chickens in the alley out back of the inn after being on the losing side of a tavern brawl. Clearly this is part of the Call to Adventure that must not be denied, but first things first: they need clothes. What do they do? We today live in an industrialized world in which consumer goods like clothes are readily available. If you need something to wear, it’s easy enough to go into a store and buy something. Unless you’re shopping for high fashion, it probably won’t cost you too much, either. All of this is possible because of factories, global transportation networks, and a modern economy, but none of these things existed before the last couple of centuries. Any time before then, buying clothes was a very different experience. To begin with, a lot of clothing wasn’t bought at all. In many pre-industrial societies around the world, producing and maintaining the family’s clothing and other textile goods was one of the main occupations of the household. Although textile production was in many cultures traditionally counted as women’s work, men were involved in it, too, at every stage from shearing sheep or gathering flax to delicate finish stitching. 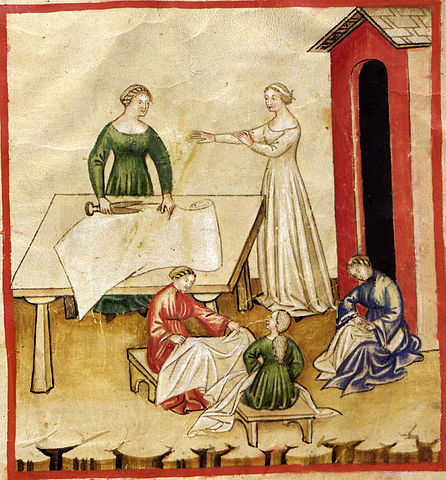 Of course, there were always people who didn’t have a household around them to help make clothes. Soldiers and travelers far from home might need to replace damaged clothing or buy new gear suitable to the local climate. In any reasonably well-developed settlement, those who needed to purchase clothes probably could. They might get lucky and find someone willing to sell off an older set of clothes, or, for the right price, they might be able to get someone to sew them up a new set to order, but the chances of finding a clothing shop with new garments ready to wear were very slim. The Roman emperor Diocletian, during a period of economic crisis, tried to stabilize the Roman economy by issuing an edict dictating wages for many different kinds of workers and prices for a variety of commodities and services. Diocletian’s edict wasn’t very effective in practice, but it’s a useful snapshot of what someone in antiquity thought were reasonable wages and prices. So, for example, the edict prescribes a price of 2,000 denarii for a common shirt. Compare that with the daily wages of 25 denarii for a farm laborer, 50 for a carpenter, or 75 for a skilled terra cotta artist. Even a well-paid artisan would have to spend most of their wages for a month just to buy a shirt. Depending on how rich Our Heroes are, new clothes could set them back a lot of money. Now, Diocletian’s edict was only one politician’s idea of what things should cost, not a record of what they actually did cost. For a glimpse of actual prices we can look to some of the letters from Vindolanda, a Roman fort in northern Britain, where some everyday letters and paperwork from the fort were preserved by chance in the local soil. Some of these documents mention tunics priced at 3 denarii, boots for 3.5 denarii, and cloaks for 11.5. These goods sound a lot cheaper, but, in this period before the economic crisis that Diocletian was trying to deal with, wages were a lot lower, too. Soldiers at the time were paid 300 denarii a year, less than a denarius a day, a portion of which was held back to cover expenses. At those levels, a soldier would still have to spend most of his pay for a week to buy a tunic, or half a month to buy a cloak. What was true in Rome was true in most other parts of the pre-modern world. There was no just nipping into a shop to buy a new set of clothes. Even where you could find clothes for sale, they were not a small expense. Outfitting one of Our Heroes in a full new set of clothes could well cost them most of their income for a year.